Learn about Indiana by reading Having Fun is In In Indiana by Charlie Spence, Aviation Writer. It features a mini, but thorough tour of the destination, plus all you'll need to know to plan your trip including getting there, objective information on places to stay and eat, and things to do. At the end of the article, we've provided a summary of the contact information for your easy reference. Enjoy! 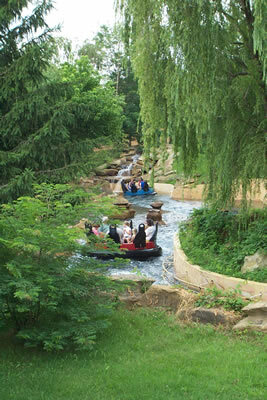 A white-water raft ride for the whole family, riders on Raging Rapids are warned, "You will get wet!" Wherever you start your visit to Southern Indiana you will find something different and interesting. Take the kids to the only town in the world that can use a postage cancellation stamp of 'Santa Claus,' visit Abraham Lincoln's boyhood home, or settle in to be pampered and take your chances at the casinos in the French Lick-West Baden area. Christmas is the most festive time in and around Santa Claus, Indiana, but it is a fascinating place any time of the year. Of course, your first stop will be at the little post office. Every year thousands of letters pass through this postal facility with volunteers called 'Santa's Elves' stamping the envelopes to make certain each child receives an answer from Santa. Drop off a few of your own cards or letters for the recipients to receive this famous postmark. You'll find eight Santa statues scattered about this rural community but the largest is 22 feet high with a base in the shape of the Star of Bethlehem announcing its dedication to all the children of the world. And the children know they are welcome. The world's first theme park is here. Opened in 1946 under the name Santa Claus Land, the park now is known as Holiday World and Splashin' Safari. From the beginning of just a Santa Claus Train, toy displays and a souvenir shop, the park has expanded to include other holiday themes and a water park. You'll find most of the businesses here have Christmas-theme names: Santa's Lodge, Christmas Lake Golf Course, and Holiday Foods. Even the streets put you in the holiday mood with names like Candy Cane Lane, Mistletoe Drive, and Christmas Boulevard. During summer months, visitors outnumber the residents of this community. Just down the road from Santa Claus is the boyhood homeland of Abraham Lincoln. He lived here during his early youth before moving to Illinois. The National Park Service operates the Lincoln Boyhood National Museum and features a film documentary. The actual site of his log cabin is on a reenactment of a working 1800s farm. The site also has the grave of his mother, Nancy Hanks Lincoln. For another interesting visit, drive a few miles to the Gasthof Amish Village where you will enjoy the recreation, shopping, food and peace and quiet in the 'Simple Life.' At Der Heuboden Shop you will marvel at the assortment of handcrafted quilts, Amish-made furniture and crafts, spices candy, and gifts. For a delightful meal, drop in at the Gasthof Amish Restaurant and Bakery, known throughout Southern Indiana for its Amish recipes and quality food. Be sure to take home some homemade apple butter and peanut butter spread. After enjoying this, are you ready for a totally different kind of travel experience? Drive about 50 miles north to the French Lick-West Baden spas, resorts, and casinos. In years past, French Lick was strictly for the millionaires who came in their chauffeured limousines to partake of the 'miracle waters' and to try their luck at the illegal casinos. Today, however, the entire area is an attractive destination for persons of any means seeking a different kind of get away. Gambling will no longer be illegal and the resorts that catered to the wealthy in years past are totally redone for today's visitors. French-Lick and West Baden are but about a mile apart on Indiana 56. The area called French-Lick was one of the earliest outposts in the middle-western wilderness, first settled by French traders more than 200 years ago. Rich mineral springs attracted animals to lick the waters and wet rocks. To those settlers this site became known as 'The Lick.' At one time the mineral waters were considered to have medicinal value. Over a hundred years ago, gambling, elegant hotels, and mineral water baths turned the area into a destination for the famous and wealthy. Movie stars, U.S. presidents, corporate leaders came. In the heydays of the 1920s there were as many as 17 casinos; four major league baseball teams came for spring training, and it was difficult to get a reservation. Over the years the healing powers of the waters have been met with skepticism. The illegal but-tolerated gambling was ended in 1949. The area still attracted visitors, but the elegance was missing. Now, it's back. Gambling in the area has been approved. The two luxury resorts are preparing and other facilities are welcoming the expected revival of large numbers of guests. The French Lick Springs Resort and Casino sports a multi-million dollar restoration. The 440 guest rooms and suites have been outfitted with completely modern furnishings and the Resort reopened in early November 2006. A new 84,000-square-foot casino houses 1,200 slot machines and table games plus a 14-table poker room. There is a six-lane bowling alley and six new eateries. You can pamper yourself in the 20,000-square-foot full service spa, salon, and health club. Personal services range from manicures to mineral baths in the noted mineral waters. The West Baden Resort is now undergoing a renovation and will reopen in late spring of 2007. The elegance of the hotel may be seen these days for tours, afternoon teas and special events. Golfers will drool over the courses. The French Lick Resort has two courses: the completely refurbished The Hill Course and a nine-hole executive course. 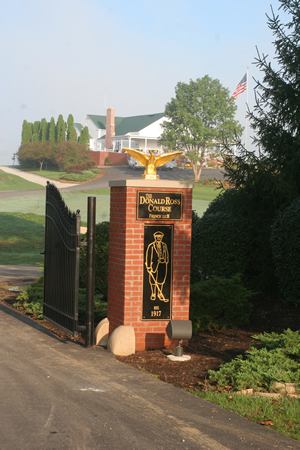 The Hill Course by Donald Ross was the site of the 1924 PGA Championship and in 1959 Betsy Rawls defeated Patsy Berg for the LPGA championship. The West Baden Resort will have a new 18-hold championship course opening in 2008. You'll find much more than these two resorts in the French Lick area. At nearby Patoka Lake take your lodging in a log cabin'with all the modern amenities. Take a boat or cast a fishing line. If you like, you can even rent a cabin floating on the lake. Travel back in time at the railway museum and ride a train through the Hoosier National Forest and Burton Tunnel. If you take the ride on one of the special weekends don't be surprised by a Wild West 'train holdup.' Or maybe you like skiing. Paoli Peaks has this and snowboarding. Whether you are looking for a quick get-away weekend or want an extended vacation that can mix relaxation with excitement, this area of southeastern Indiana is certainly a place to look into. What once was the gathering place for the elite is fast becoming an elite place for gathering. There are two good airports in the area depending on where you want to start your visit. Huntingburg (HNB) is about 20 miles north of Santa Claus. There is a 5,000X75 asphalt runway (9-27) and VOR, NDB, and GPS RNAV approaches. The VOR is on the field; the NDB 5.5 miles away. No tower; Unicom is 122.8. Hours are 7:00 am to 6:00 pm. No landing or parking fees. Jet-A and 100LL fuel available 24/7'with call out fee. Overnight hangar accommodations from J3 to Falcon 50. The French Lick Municipal Airport (FRH) is three miles south of the city. The runway (8-26) is 5,500X100, approaches are NDB and GPS RNAV. There are tie-down and overnight parking fees. Hours are 9:00 am to 6:00 pm. Fuel: 100LL and jet. Rental cars are available at both fields. Places to stay are as numerous and varied as are the attractions. French Lick Resort and Spa has 470 newly-renovated rooms and suites with rates beginning about $140. Casino and mineral baths right on the property. Motels include Lane's (43 rooms) and Michael T's (10 rooms) at French Lick; and Midwest Inn (20 rooms) at Ritz (18 rooms) at nearby Paoli. Bed & Breakfasts include Beechwood Inn (6 rooms) at French Lick; Eb Rhodes House (4 rooms) at West Baden; and Big Locust (6 rooms) and Underwood Inn (5 rooms) at Paoli. If you like more rustic, check into Wilstem Guest Ranch (4 cabins) or Pines T Patoka Lake Village (12 cabins) at French Lick, or Patoka Chalets (2-4 & 5 bedroom cabins) at W. Paoli. In the Santa Claus area, look into Santa's Lodge or Locust Inn Motel, Baymont Inn & Suites, or Rockport Inn B& B. Several fine eating places are in the French Lick Resort and Spa. Try Jack's Steak House or La Bistro. Beechwood Inn B & B is another excellent spot with elegant surroundings in French Lick. In West Baden try The Villager. Also, stop in at The Winery where award-winning wines are produced on site and where the Vintage Caf' serves Italian cuisine. You can check rates and book your room and rental car at IFA's Online Travel Booking Service at www.iflyamerica.org/travelservices/travelservices.asp. Significant discounts may apply. Notice: This information is current as of October 2006. It is recommended that you contact the numbers, and/or visit the websites above to determine any changes to the information.